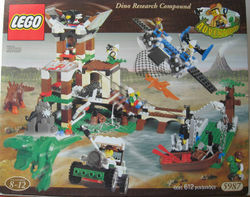 Dino Research Compound is a Dino Island set that was released in 2000. This is the largest set in the Dino Island sub-theme. It is a three-story research building complete with six Minifigures - Johnny Thunder, Pippin Reed, Dr. Lightning, Mike, Mr. Cunningham, and Baron Von Barron. It also includes four dinosaurs - a T-rex, a Baby T-Rex, a Stegosaurus, and a Pteranodon. This set contains many dinosaur catching tools and vehicles, including a twin-engine aeroplane and a car. The compound is situated on a river. The Compound was featured on Dino Island. Mike speaks to the player in front of it. The car included with this set appeared in the Dino Island circuits as an enemy racer, being driven by the Martian Cassiopeia, but the player also had the option of using it as his or her own. The plane included with this set is also featured in the game. Oddly, though, it is not found on the Dino Island world. It is orange instead of blue, and it is found on the Arctic world. Facts about "5987 Dino Research Compound"
This page was last edited on 9 January 2016, at 19:19.